It’s been months since Hurricane Harvey came through Houston but the impact brought on by the historic flooding still remains an issue for several Houstonians trying to get their lives back to where they were before the storm. Lots of people have had to completely gut their homes and businesses because of the damage and are still rebuilding. At Modern Stone Care we know this is a difficult time for home and business owners. Rebuilding is not only extremely expensive but also stressful. We also understand that this is a time you need to be able to work with trusted craftsmen, like us, who care about getting your life back to where it was before the storm. There is an influx of contractors in the area taking on jobs they are not qualified for and natural stone must be handled delicately. Many of these contractors will suggest pressure washing your stone which can actually cause worse damage to your vulnerable Travertine. There is good news though! While travertine and other natural stone’s are very porous in nature and sensitive to harsh chemicals and acidic substances they’re actually more resilient to flooding than most people might think! Instead of having to replace your Travertine floors there is a good chance they can be restored with the help of Natural Stone experts. Travertine is a calcium based bonded stone. Standing water on top of the stone causes erosion which eats away at the integrity of the stone. The only way to combat this process is with specialty products designed to strengthen the calcium bond. 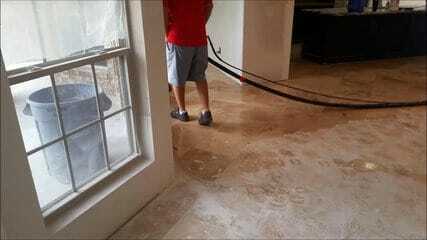 If your Travertine was in good condition before the flood, being regularly cleaned and maintained without serious prior damage there is a good chance it can be restored. Here at Modern Stone Care we care about Houston and want nothing more than to help you smoothly transition back into normalcy. We proudly serve The Greater Houston Area, including but not limited to, Atascocita, Bellaire, Clear Lake, Cypress, Friendswood, Houston Heights, Houston, Humble, Katy, Kemah, League City, Kingwood, Memorial, Missouri City, Montgomery County, Spring, Spring Branch, Stafford, Sugar Land, Tomball and The Woodlands.